At Framework Galley we understand life can be somewhat hectic and that you may not be able to visit us at our premises during normal business hours. As part of our Picture Framing Services, for local Kapiti Coast residents and businesses, we will visit you at a time and location of your convenience. 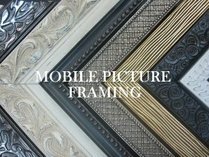 This provides us with an opportunity to design a framing solution not only appropriate for the artwork but also the setting within your home or business environment. With the use of advanced software we can electronically provide a number of potential framing solutions for your consideration. This makes it far easier to visualise different framing solutions as a finished product and select the perfect solution for your setting. At Framework Gallery we offer our clients a complimentary collection and delivery service between Waikanae and Paekakariki. We are happy to collect and deliver outside of these area's although this may be subject to charge. Please click here to use our Contact Form or call during business hours on (04) 9025626 to discuss your requirements. An unframed photo is an image. A framed photo is a family heirloom.